The first Cybersecurity Trophy 2017, awarded to Cécile Pierrot. Picture: C. Pierrot. 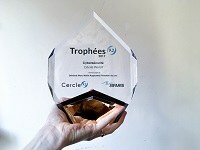 Cécile Pierrot from the Cryptology research group at CWI won the first Cybersecurity Trophy granted by Cercle K2. This French think tank awards prizes in 22 various topics, from machine learning to oncology, every two years. It aims at stimulating interdisciplinarity and promoting young researchers. The first Cybersecurity Trophy 2017 rewarded Pierrot’s PhD thesis ‘Le problème du logarithme discret dans les corps finis’, which she defended at UPMC in Paris on 25 November 2016. The award winning PhD thesis deals with the discrete logarithm problem, which is mainly used in cryptology. Cryptology, in general, studies techniques for secure communication in the presence of adversaries, accumulating in cryptosystems that explain how to securely encode and decode messages. They are often based on the assumption that it is difficult to solve a specific mathematical problem, making it hard to break in practice by any adversary. These hard computational problems often come from number theory, such as integer factorization or discrete logarithms computations. Pierrot, who is now a postdoc researcher at CWI, says: “I studied the weakness of the discrete logarithm problem in finite fields, one of the two widely used hard problems for public key cryptography”. Among others, she proposed the best theoretical algorithm, for the currently hardest finite fields known. She also helped to discover methods permitting to reach new discrete logarithms record computations in practice. Among all other young researchers working in IT related issues, the Cercle K2 wanted to reward Cécile Pierrot for both theoretical and practical impacts of her results. “A good understanding of the difficulty of this problem is essential to be able to advice companies and governments to choose secure parameters for their communications”, the jury said.